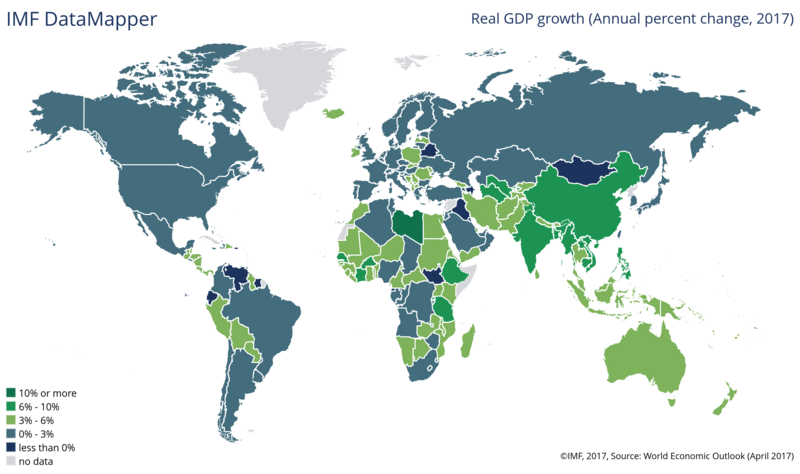 Scooper - Technology News: Are we right to be optimistic about global growth? Are we right to be optimistic about global growth? As the annual spring meetings of the World Bank and the International Monetary Fund commence, the world’s economic future appears brighter than it has in some time. The international financial institutions, not to mention many private-sector actors, are projecting significantly faster growth this year than in 2016. Is their buoyant outlook warranted? Until recently, most macroeconomic indicators were regularly leading to downgrades in growth projections. Now, the opposite seems to be happening. The IMF’s recent flagship report raised its projection for world GDP growth for 2017 from 3.4% to 3.5%, compared to the estimated rate of 3.1% for 2016. Likewise, the multi-indicator Brookings – FT TIGER Index points to a “broad-based and stable” recovery. According to these projections – which are based on models, new data, and the judgment of the particular institution or forecaster – the United States, the United Kingdom, and Japan are contributing the most to the uptick in growth. India is also doing particularly well. Deciphering these projections’ various components – from the new information to the forecasters’ hypotheses – would be a huge task. But, whatever reasons for optimism forecasters may have, there are also strong grounds for caution, especially in the medium and long term. Forecasters, like markets, are often influenced by “herd instinct.” The greater the number of analysts who subscribe to a particular view, the more likely it is that additional analysts will shift their own forecasts in that direction. In this case, the majority’s rather optimistic view has been buttressed by a broad sense of relief. Both the Brexit vote in the UK and the election of Donald Trump as US president raised fears of economic disaster. Yet, so far, neither development has had particularly dire economic consequences. On the contrary, market confidence remains high, boosting expectations of increased investment and consumption. It is telling that the US Federal Reserve has now pursued modest interest-rate hikes without triggering an adverse reaction even in emerging markets, which last year were dreading such a move. Against this background, economic optimism makes some sense. But growth remains vulnerable to the as-yet-unresolved issues that kept dragging down previous forecasts. One of those issues is slowing productivity growth, which has held back global economic performance, to varying degrees, for the last two decades, with no sign of reversal in sight. Another is economic inequality, which seems largely to be worsening, as wealth becomes increasingly concentrated at the top of the income distribution. Inequality seems likely to continue to undermine aggregate demand, even if GDP growth accelerates in the short term. Not even a decline in unemployment would do much to boost demand, not least because such a shift could well be driven by falling labor-force participation, as has often been the case in the US. This points to another vulnerability: weaknesses within labor markets that have proved particularly damaging for the young. Then there is climate change. The world has still not answered what is perhaps the biggest question affecting long-term growth: how can the global economy continue to expand rapidly, without allowing the average global temperature to climb more than 2° Celsius above its pre-industrial level? With the Trump administration unwilling even to acknowledge the risks posed by climate change – including increased migration – we may actually be moving away from a solution. There is a broad consensus among economists that long-term growth can be secure only if it is both sustainable and inclusive. In other words, if the world economy is to perform at potential – which can mean growth rates of, say, 2.5-3% in the US and Europe, together with 5-6% growth in the emerging economies – we need to reverse some of today’s most powerful trends. On inequality, success will require stronger and more flexible labor markets. To this end, we need to develop education systems that provide the digital and civic skills that a twenty-first-century labor market demands. We also need to introduce modern and sustainable social-welfare systems, including fully portable benefits. And we need to implement strategies for managing migration. As for climate change, we need a global system of implicit or explicit carbon pricing, spearheaded by the world economy’s most influential actors. In line with the December 2015 Paris climate agreement, the range of carbon pricing should take into account, to some extent, historical responsibilities, as well as current income levels. There is one more prerequisite for sustainable growth: relative peace and security. This demands a strong international governance framework in which conflicts are resolved by negotiation and compromise, though strong defenses – both traditional and non-traditional (for example, cyber security) – will also have an important role to play in guarding against major threats. Here, updating multilateral institutions, which have long played an important stabilizing role, will be crucial. That means resisting the trend, which has lately gained momentum, toward bypassing these institutions in favor of bilateral or regional arrangements. More fundamentally, it means rejecting old-style nationalism, which threatens to drag us back to the 1930s, rather than preparing us for the 2030s. None of this is to say that the 2017 projections for GDP growth will be proved wrong. On the contrary, it is possible that the world will experience even-faster-than-expected growth this year, with growth forecasts being revised upward again this summer. But these gains are likely to be short-lived, unless policymakers seize the opportunity that they provide to address the deep-seated structural challenges that, if left unresolved, will undermine growth in the longer term.